« Where Does PR Fit in the Green Job Revolution? Classifying the following gadgets as crazy is far from a stretch. However, determining whether these gizmos are crazy cool or crazy ridiculous can only be decided by consumers. One thing I know for sure is that there are some green-minded and extremely creative people developing interesting products. Estimated electricity consumption in the residential sector from “information and communication technologies” and “consumer electronics,” 1990-2030. Technology has become a large part of our daily lives. In fact, the global gadget habit is seen by many as an opponent of sustainability. With millions of tons of electronic waste being produced each year, e-waste has become a mounting global problem. Therefore, it is vital that we think outside of the box to create biodegradable and energy efficient alternatives to the products we use in our daily lives. This gadget takes a new approach at sustainable energy by using the heat of your feet. The boots harness enough energy from the heat to power small electronic devices. It takes approximately 12 hours to produce enough energy to charge your cellphone for an hour. This portable battery charger is powered by saltwater or even more accessible – urine! It is simply ready for use anywhere. Rumored to be developed for the South Korean military, the battery combines the chemical properties of magnesium with the sodium in saltwater or urine to create a low voltage current. 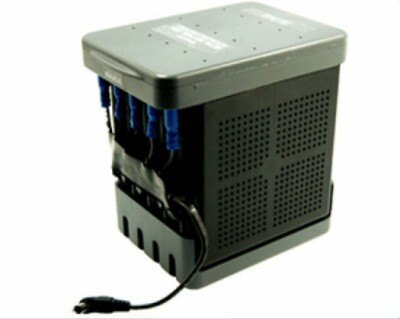 The battery generates enough electricity to power flashlights or even laptops. Are you one of those people who have a hard time letting go of really sentimental cards? Don’t throw it away…just eat it! A British design company has created edible sprout and potato-based Christmas cards. The cards are printed with food coloring rather than ink. It is a great way to speed up compost! Do you have that one pesky roommate that uses up all of the hot water? Do you shudder at your water bills? 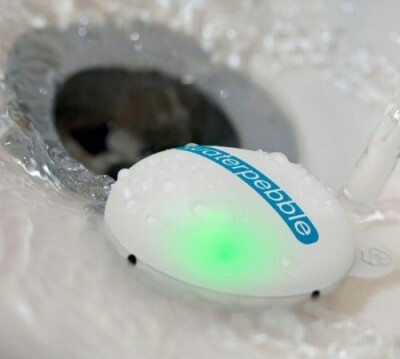 The creators of the waterpebble have found a convenient way to monitor your shower usage. The pebble uses three lights to display whether you have used too much, just enough or a planet-saving amount of water. The waterpebble records the amount of water consumed the first time that the monitor is used. It then subtracts a minimal amount each time you shower to gradually determine what is “just enough” and minimize your water consumption. Perhaps the best green gadgets are not the most complex, but rather the simplest and most useful. Pictures of college parties are littered with infamous red party cups. This eco-pint is a great alternative to petrochemical based plastic cups. The tumbler material is derived from corn starch and is 100% biodegradable and compostable. You can now be the coolest and greenest one at the party. I want those boots! Great post! What interesting gadgets! This post is great! I definitely wouldn’t have even known any of these things existed. I agree with Anne that I would love a pair of those boots, but I could see that shower monitor being something especially great for nearly anyone. I love that concept, and it seems like it makes it really easy to include environmentally conscious practices into everyday life. Thank you Anne, Margie & Ellen. Of course some of them are a little off the wall, but I agree that they have some marketing potential. I love the idea of plastic dinnerware! For the cups-I think the idea of having biodegradable and compostable cups is a great thing. But the bad thing is that not a lot of people know that these cups are an alternative to other cups being used. I would definitely use these if I need plastic cups for a gathering for easy clean up. I think if these cups were better marketed people would buy them. The only bad thing is if they are clear some people may not want to use them, if a color option was avaliable they would be favored more by college students and their parties. And for the christmas cards, I’m not sure anyone would eat that, but it’s a really different idea. Also the boot idea is neat, I would for sure buy a pair of those if they could charge a cell phone! Megan, I completely agree that there is a need to improve the marketing of the products. I think that is where PR professionals come in. Public relations professionals and students have a great opportunity to push these products and causes further. I like the idea of the shower pebble. I know I probably use too much water in my 30-minute showers (sorry, Earth! ), so that would be a great way to save both time AND water. As for the portable battery, I’m a bit skeptical on that one, though I bet it would be good for road trips!